Betty’s Tea Rooms is a famous Yorkshire name in tea shops and the York branch has become the flagship for the chain. It has two floors and both are places to enjoy the best that Betty’s has to offer. The establishment serves main meals as well as pastries, cakes, breakfasts and light lunches, but most desired of all is the traditional Afternoon Tea of sandwiches, cakes and scones. So popular is Betty’s, that if you want to eat here, you will probably have to queue, especially at main meal times. This is because they do not take reservations for the café. On our visit to Betty’s we joined the queue outside and waited for it to move along which it did quite quickly. We went from standing on the street to being seated in about half an hour. However, we were happy to sit downstairs and the wait is longer if you insist on sitting in the ground floor cafe. When visiting Betty’s, don’t miss the little piece of WW2 history downstairs near the toilets. During the war, this area was a bar frequented by those in the forces and the mirror here has been etched with hundreds of signatures of those who spent time here. 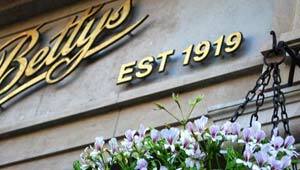 Betty’s prides itself on great quality food and it’s certainly an experience eating there. You just have to soak it up and enjoy yourself, without dwelling on the prices. To be honest, for the quality of food, the prices are actually quite reasonable. Betty’s also has a cake and bread shop inside if you’d prefer to take away. Again, you can expect to queue to be served in the shop at busy times. Although you have to queue for the main café, you can book ahead for Afternoon Tea in the Belmont Room every Saturday and Sunday from 12.30pm. This room was inspired by the Art Deco state rooms on the Queen Mary cruise liner and is named after Frederick Belmont, who founded Betty’s and was on the maiden voyage of the ship. Booking ahead for Afternoon Tea costs around £26 but is more like £33 if you add a glass of champagne (2012 prices). Betty’s is open every day from 9am to 9pm.